Effects of World Youth Days: Click Image to download PDF. Since around 2000 and especially since the World Youth Day (WYD) in Sydney in 2008, the Church in Australia has put a lot of energy into promoting the attendance of young people at the WYDs held internationally every three years. Australia has also now begun its own cycle of national events (the Australian Catholic Youth Festivals or ACYFs), also slated to occur every three years and modelled substantially on WYD. A question that is commonly raised by priests, educators, youth ministers and people is: is it all worth it – and what is the evidence? I encourage you to download and read my new paper here. This entry was posted in World Youth Day and tagged world youth day, wyd on August 13, 2014 by archsydney. The great philosopher Elizabeth Anscombe once told the story of a child – I suspect one of her own children – who was nearly three years old and only then beginning to talk. The child had gradually been introduced to the mystery of the Eucharist in simple language. The mother was coming back from Holy Communion and was met by the child in the free space at the back of the church. “Is He in you?” the child asked. “Yes,” said the mother and to her amazement the child immediately prostrated before her! What that infant grasped, with childish innocence, is one of the Church’s central proclamations: that this really is the Body and Blood of Christ that we celebrate today. Christ is really present here in a way, with an intensity, He is nowhere else on earth. This year marks the 750th anniversary of the papal bull, Transiturus, by which Pope Urban IV promulgated the feast of Corpus Christi, the Body and Blood of Our Lord, for the Universal Church. He also commissioned St Thomas Aquinas to write the prayers and hymns for the feast we still use in the liturgy today. Let me share with you some thoughts about the importance of this wonderful Sacrament for our daily lives and how we might better express this. An ancient love-song, Psalm 62, begins with the hunger in the human soul: “O God, you are my God, for you I long; for you my soul is thirsting, my body pines for you.” This theme recurs throughout the Old Testament. With the coming of Christ it became clear that He is the food and drink we most deeply desire. But is physical contact with God really desirable? Aren’t words and thoughts enough? No: we are spiritual and material beings. Only by becoming a bodily being could God express Himself in touch and tears, through soothing words and loud cries, in all the ways human beings do. Jesus is no ghost or theory: He is God communicating His life to us as a flesh and blood human being, in bodily signs and visible symbols. So before returning to the Father, He chose to continue this physical-spiritual connection with us through the sacraments. The greatest of these is the Eucharist, “the sacred banquet in which Christ is received”. Here Jesus gives His all: His body, blood, soul and divinity. As St John Paul II put it, under simple signs of bread and wine we receive “the unfathomable holiness of God”. This is why we approach with the humility of the centurion who said: “Lord, I am not worthy that you should enter under my roof” (Mt 8:8). The psalmist continues: “your love is better than life, my lips will speak your praise” (v.3). God gives Himself to us and in return we render Him eucharistou, which means thanks and praise. The Eucharist is our biggest ‘thank-you to God for sending His Son to save us – indeed the only adequate thanks we could offer. So the Mass is not just a nostalgia trip to 1st Century Palestine: rather, it extends the all-sufficient sacrifice of Good Friday to every time and place; here and now “the work of our redemption is accomplished” and we participate in it. When the priest says the words of consecration – “Take this, all of you, and eat of it, for this is my Body … Take this, all of you, and drink of it, for this is the chalice of my Blood” – the Sacrifice of Love anticipated on Holy Thursday, consummated on Good Friday, and victorious at Easter, is ours to receive and to offer to the Father! “My soul shall be filled as with a banquet,” sings our psalmist (v. 5). More than our bellies the Eucharist fills our hearts, minds, souls. We all know the experience of emotional and spiritual exhaustion, of lacking inspiration and purpose, of just going through the motions of living. We need regularly to be recharged with divine life or grace. But Holy Communion is not magic. If we don’t prepare well, we won’t get what we could from the Mass. So we fast for at least an hour before Holy Communion. We confess all serious sins in Confession and all lesser ones during the Penitential Rite in Mass. If we are not yet a Catholic, or have committed some serious but not-yet-absolved sin, or if we are otherwise not well disposed, we abstain from Communion until we have rectified things. Likewise, we try to let go of the grudges and distractions that might block our receptiveness. We can prepare also by reading the set Scriptures prayerfully in advance; by attending Mass or visiting the Blessed Sacrament during the week; and by arriving early to pray before Mass (quiet in church permitting). One way or another we must get into the rhythm of attending Mass every Sunday as God and the Church call us to and open ourselves up to receiving the graces of the Mass. Our psalmist continues: “my soul clings to you; your right hand holds me fast” (v. 8). The lovers’ hope – never to be parted – is our Eucharistic hope, foreshadowing, as Pope Francis points out, that more perfect union we will have with God and each other in the heavenly banquet. In old English couples “pledged their troth” in marriage, that is, gave their truth or word of honour. Corpus Christi commemorates God giving His word – His Word-made-flesh, Jesus Christ – as Bridegroom to the Church. At the Last Supper Jesus washed the feet of His bride the Church, as some of the ancients did in their wedding ceremonies; He then gave His Body to her in the Eucharist; and finally, from the Cross, He declared “it is consummated”. Jesus renews that marriage vow, to be with us always, whenever the Eucharist is celebrated. So the Eucharist recalls not only the past (what Christ has done for us) and informs the present (by uniting and inspiring us now), but also promises future glory (preparing us for it). Early Christians called it “the food that prepares us for incorruptibility”, “the journey food” on the way to heaven and “the medicine of immortality”. Like spiritual superannuation it gives us security for the future, getting us ready for the afterlife. But the future starts today. When the priest says “Go forth, the Mass is ended”, he’s not just saying “get out of here”! He is saying: go and unpack the Eucharist in your everyday life. Give thanks for gifts received. Now turn your gaze to your neighbour in need. Live the ideals proclaimed in this Mass. Build a more just and compassionate society. Take Him whom you have received in word and sacrament to your next six days of work and family. Act in communion with God and the saints all week long. Our whole being should be seized with awe, the whole world should tremble and heaven rejoice, when Christ the Son of the living God is present on the altar in the hands of the priest. What wonderful majesty! What stupendous condescension! … In this world I cannot see the Most High Son of God with my own eyes, except in His Most Holy Body and Blood. Around the same time St Thomas Aquinas explained in a way still unsurpassed how bread and wine become the Body and Blood of Christ (‘transubstantiation’); but he was a devotee of that sacrament before he was its metaphysician. He understood that such love and awe must be expressed bodily. So devotion towards the Blessed Sacrament came to be expressed in prayer before the tabernacle, Exposition for Adoration and Benediction, even processions and all-night vigils – all of which are still valuable practices today. One particular way we demonstrate our love is on our knees. Even today men often go down on one knee to propose to their future wives. For the ancients it was natural to fall prostrate before the mystery of God. In the Gospels wise men kneel to shower the Christ-child with gifts and Peter does so in awe of Jesus’ power; a leper kneels to ask Jesus for a cure and another to thank Him for the cure; parents kneel before Him to ask for cures for their children; a woman kneels to ask that she be healed of a haemorrhage and a young man to ask how to live. If Jesus Himself could kneel to pray in the Garden that was good enough for His followers: and so the first martyr Stephen was on his knees as he died and the apostles knelt down to pray. In C.S. Lewis’ famous Screwtape Letters amaster demon teaches an apprentice various tricks to lure human beings off the right path: one good one, he explains, is to trick them into thinking the body doesn’t matter in prayer. Stop them kneeling and eventually you’ll stop them adoring. This devil was clever! There is wisdom, then, in the clear direction of the Roman Missal for us to kneel for the Eucharistic Prayer unless serious reasons prevent us. That’s also why we genuflect to the tabernacle on arrival at church, bow (or genuflect) before receiving Holy Communion reverently in the hand (or on the tongue), and kneel or sit during the sacred silence after Communion. Some think such ‘bowing and scraping’, even to God, is demeaning. People are right to say we shouldn’t kneel if, due to arthritis or another condition, this would detract from devotion; kneeling is only one way of demonstrating reverence; and what is in the heart is more important. But bodily beings must find postures that cultivate ‘the sense of sacred’, and express their awe and trust before the mystery of God. we all consider how we might live more Eucharistic lives after Mass. Thanks be to God for this wonderful Sacrament that the Second Vatican Council so memorably called “the source and summit of the whole Christian life”. Thanks be to God for your devotion to it! May our Eucharistic Lord hold you close to Him always. In the words of our blessing prayer: “Grant, O Lord, we pray, that the Christian people may understand the truths they profess and love the heavenly liturgy in which they participate, through Christ our Lord.” Amen! G.E.M. Anscombe, “On Tranbsubstantiation,” Faith in a Hard Ground: Essays on Religion, Philosophy and Ethics (ed. M. Geach & L. Gormally, Exeter: Imprint Academic, 2008), 84-91, p. 86. On which see Paul Murray op, “Corpus Christi: authorship, history and composition,” Aquinas at Prayer (London: Bloomsbury, 2013), ch. 7. In Protestant Bibles this is numbered Psalm 63.
 e.g. Pss 36:8; 143:6; Isa 12:3; 25:6; 44:3; 49:10; 55:2; Ezek 47:1-12; Zech 14:8. Jn 4:10,13-5; 6:35,53-8; 7:37-9; 19:34; Rev 7:15-7; 21:6. Vatican Council II, Sacrosanctum Concilium: Constitution on the Sacred Liturgy §2. Cf. St Thomas Aquinas, Summa theologiae III, 79.7.2. Regarding the need for Confession see my previous pastoral letter, Come back to me with all your heart: On Rediscovering the Sacrament of Reconciliation (Lent 2011). On the importance of the Sunday Mass attendance, see especially St John Paul II, Dies Domini: Apostolic Letter on Keeping the Lord’s Day Holy, Dies Domini (1998) esp. 30, 46-50. Pope Francis, General Audiences, 5 and 12 February 2014. Mt 28:20; John Paul II, Ecclesia de Eucharistia §48; cf. Pope Benedict XVI, Deus Caritas Est: Encyclical on Christian Love (2005) §§13-4 on Eucharistic mysticism. St Ignatius of Antioch (c.110 ad), Ad Eph 20:2; Ad Symr. Ch. 6; Ad Phil. 4:1; Ad Rom 7:3; St Justin Martyr (c.150 ad), Apologia I, 66; Trypho 41; St Irenaeus (c.140-202), Ad Haer. IV,17:5; 18:4-5; Ad Haer. V, 2:2-3; Tertullian (c.155-250), De Resur. 8:3; Origen (185-254), Contra Celsum 8:33; Hom. in Ex. 13:3; St Clement of Alexandria (c.150-216), Paedag. I, 6:42; St Cyprian of Carthage (c.200-258), Pater Noster 18. In D.P. Guernsey (ed. ), Adoration: Eucharistic Texts and Prayers throughout Church History (San Francisco: Ignatius Press, 1999), p. 62. St Thomas Aquinas, Summa theologiæ, II-II, 168, 1; Joseph Ratzinger, The Spirit of the Liturgy (San Francisco: Ignatius Press, 2000), pp. 190-1.
 e.g. Ex 3:1-6; Lev 9:24; Dt 9:18,25; Num 17:10; 20:6; Josh 5:14; 7:6; 1Kgs 8:54; 2Kgs 17:36; Pss 22:29; 86:9; 95:6; 138:2; Isa 45:23; Mic 6:6; Job 1:20; Judith 6:18; 9:1; Sir 50:17,21; Isa 49:7; Ez 10:1; Dan 6:11; Acts 7:32-33. Mt 2:118:2; 9:18; 15:25; 17:14; Mk 5:33; 10:17; Lk 5:8; 17:16. Mt 17:6; 26:39; Lk 5:8; 22:41; Acts 7:60; 9:40; 20:36; 21:5; Eph 3:14; Rom 14:11; Phil 2:10. C.S. Lewis, The Screwtape Letters (London: Harper Collins,, 2002), p. 16. Vatican Council II, Sacrosanctum concilium: Constitution on the Sacred Liturgy §10. The Catechism of the Catholic Church takes this description as the starting point for its treatment of the Eucharist in §§1322-1419. What does the Eucharist mean to me, my family and friends? How could my parish or community draw people into greater devotion to this wonderful sacrament? How can we share this better with our young people? What are the implications of the Eucharist for life after Mass? This entry was posted in Blog, Messages & Letters and tagged body of christ, corpus christi, eucharist on June 19, 2014 by archsydney. This afternoon in Rome Pope Francis will host a prayer meeting for peace with the Patriarch Bartholomew I of Constantinople, the President of Israel, Shimon Peres, and the President of the Palestinian Authority, Mahmoud Abbas. This follows his impromptu invitation to the three when he was in the Middle East a fortnight ago. In recent times Pope Francis has focused his energies on promoting unity and peace in troubled parts of the world, such as Palestine, Syria, Ukraine and the Central African Republic, where 18 people sheltering with their priest in a Catholic church were killed by a rebel militia just this week. This entry was posted in Homilies on June 13, 2014 by archsydney. The first session of Oceania bishops meeting today was led by a Fijian bishop. He discussed how Catholic social teaching can help emerging democracies in the Pacific. In view of recent Federal budget we have our own challenges in applying Christian principles to politics and finances in Australia too! The second session today discussed responses of bishops and people to consultations for coming Family Synod. Need for new pastoral approaches, a “nuptial catechesis” faithful to the teaching of Christ and the Church and accessible to all, touching hearts and shaping lives, sporting struggling marriages and families. Holy Family of Nazareth, pray for us! Bishops addressing estrangement between the Gospel of life and love and our increasingly secular culture. Loss of credibility due to clergy abuse crisis and mishandling. Our culture values freedom above all, disconnected from nature, commitments and ethics. A culture of temporary intimacies, variety, no strings attached (or only loosely attached). Challenge of freedom-truth-love connection has been constant theme of last three popes. How are we to draw people into willing self-giving and persevering commitments? Christ our hope! This entry was posted in Blog, FCBCO and tagged catholic social teaching, nz, oceania bishops conference, poverty on May 15, 2014 by archsydney. Can Mass and Prayer be the new normal for youth? Yesterday, I attended brilliant workshop by an inspiring Catholic school teacher, Rachel Pitcaithly about, “Developing young people with Catholic Hearts and Minds”. She reported on extraordinary success in a Christchurch boys college in getting the boys praying and attending Mass as the new normal. Lots of ideas here to be trying back in Australia! This entry was posted in Blog, FCBCO and tagged confession, Jonathon doyle, mass, prayer, Rachel Pitcaithly, reconciliation, youth on May 15, 2014 by archsydney. This morning the Pacific bishops discussed two subjects: pastoral planning – and earthquakes! Then we had Mass with students from all the secondary schools of the diocese, followed by another ferocious haka from the boys of St Patrick’s College Wellington. Archbishop Adrian Smith of Honiara in the Solomon Islands preached a very funny homily inspired by today’s feast of St Matthias, the first person called to succeed the apostles. 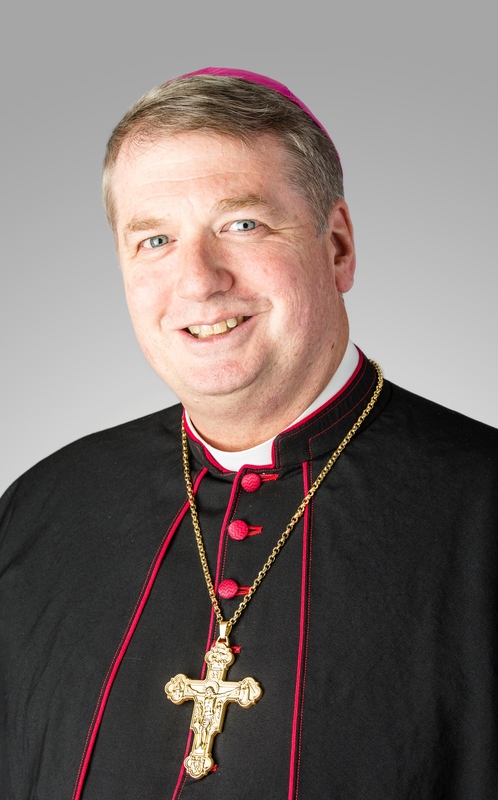 He challenged the young people to take their turn as apostles – some even as bishops. This entry was posted in Blog, FCBCO on May 14, 2014 by archsydney. In last night’s blog, I talked about opening of the Federation of Catholic Bishops Conferences of Oceania. Here are some of the pictures taken by Adrian Heke and courtesy of the New Zealand Catholic Bishops Conference. Kia Ora! Greetings from New Zealand / Aeotora. I am at the Federation of Catholic Bishops’ Conferences of Oceania in Wellington for the four-yearly meeting of all the bishops of Oceania. Last night we were given a pōwhiri or ceremonial welcome by the local Maoris. There were many speeches, songs (we sung the Salve Regina and the Pater Noster in reply to the Maori songs). As is the custom, noses were pressed and hands shook, followed by Mass in Sacred Heart Cathedral and then a hākari (feast). There is a very strong sense of the Church of the Pacific amongst us and even the tiniest island nations have their bishop or administrator here. I attended an interesting workshop analysing all the evidence about Gen Y and how connected / disconnected they are from the Church. Good discussion of what works in bringing them closer to Christ, his sacraments and his community. St John Paul would be pleased! This entry was posted in Blog, FCBCO and tagged nz, oceania bishops conference on May 13, 2014 by archsydney. As I depart from Rome after this historic event I offer a final two-part reflection on the ministry of Pope and John Paul II’s visit to Australia. The Gospels offer us a number of very moving vignettes of Jesus’ encounters with the first predecessor of Sts John XXIII & John Paul II, St Peter: the call to “Come follow me & I will make you a fisher of men”; Peter’s profession of faith “You are the Christ, the Son of the living God” and Jesus’ response “You are Peter, the bedrock on which I’ll build my Church… I give you the keys to bind & loose”; Jesus’ further charges to Peter “Be not afraid… Confirm the brethren… Do this in memory of me… Feed my sheep… Try again: cast your net into the deep… Go out to all the world & proclaim the Gospel.” It is to texts such as these that we return time & again to discover role of popes who would be saints. Perhaps Jesus’ most touching encounter with the first pope was after his Resurrection. As Jesus had predicted, Peter had three times denied knowing him. Now Jesus requires him three times to profess his love. Peter does so immediately. Rather than reminding him about his failures Jesus presses him about what he will do next, do now, do instead. At first Peter doesn’t understand what this is all about, but Jesus gives him intimations about his future & about the future of the Petrine office. You will lead the Church in difficult times, He warns. You will be led where you’d rather not go. You will suffer in the process. You will spend yourself completely for God & the Church. John Paul II’s visit to Australia. St John Paul’s longest apostolic journey, of the many he made, was in 1986 when he travelled 30,000 miles to Bangladesh, Singapore, Fiji, New Zealand, the Seychelles & of course Australia. In Sydney he held hands & danced in a conga-line with youngsters in jeans; in Melbourne he conducted an impromptu Q&A with primary school kids; in Alice Springs he encouraged Aboriginal Australians in their struggle for justice & reconciliation; in Brisbane he visited a hospital & cradled a koala; and in my own Diocese of Parramatta – then only a few months old – he wore a hard hat in a factory & told workers about the dignity of work. He made a deep impression upon Australians. When Jesus told Peter about his mission as Pope – Papa for the Church & Vicar of Christ – he said he must feed or shepherd the sheep of Christ’s flock. But he added that he must feed the lambs. The young Christians that would come in the future mattered a lot to the Risen Christ. How was Peter to tend the lambs? World Youth Day was one of John Paul the Great’s brilliant pastoral moves in Petrine feeding of the lambs – one which we experienced in Australia in 2008 at the instance of his successor, Pope Benedict. Two great shepherd popes, Benedict and Francis, joined together yesterday to canonise two great shepherd popes, John and John Paul. Let us rejoice and be glad, Alleluia! This entry was posted in Blog, Canonisations JPII & John XXIII on April 28, 2014 by archsydney. Good Pope John & John Paul the Great have just been canonised. All around the city there were crowds gathered at sites with screens as the area around St Peter’s filled with a million pilgrims. It was a wonderful atmosphere of excitement and prayer. Many slept out overnight amidst fog and threats of rain but in very good spirits. Many streets are closed off and it is was very difficult even for the concelebrating bishops to get near the basilica. Everywhere there were groups singing and praying, with banners or flags, with helicopters overhead, ‘portaloos ‘and security on the ground, all very much like a World Youth Day. A thousand Bishops were in attendance and a million faithful. Before we processed out it was good to see my fellow brother Bishop (and formerly from our Diocese), Bishop of Toowoomba, Robert McGuckin. Bishop Bob McGuckin, Bishop of Toowoomba and I before we process out. Crowds as far as the eye could see. It was a day of four popes, two living here on earth and two declared saints in heaven. Emeritus Pope Benedict joined Pope Francis as Pope John Paul II & Pope John XXIII were proclaimed saints. 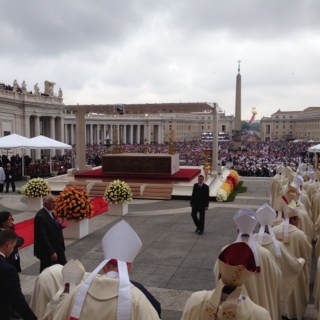 As Pope Emeritus Benedict joined us and there was a great cheer amongst the constant ringing of bells. There were many heads of state arriving – including the Italian & Polish presidents. Pope Emeritus Benedict greets dignitaries. Then the moment came where Pope Francis proclaimed these blesseds as saints, with the relics we were now in the company of two of the greatest men of the 20th century. In his homily Pope Francis reminded us that these men lived through tragic events of the 20th century but were not overwhelmed by them. That they were Popes who brought us hope and joy. After Mass finished Pope Francis thanked the many who were involved in the organisation, including the media for allowing people at home to experience the occasion. I was able to visit and pray at the tombs of Pope St John XXIII and Pope St John Paul. I prayed for you and your intentions. After the Mass I prayed for you all at the tombs of Sts John Paul II & John XXIII . This entry was posted in Blog, Canonisations JPII & John XXIII on April 27, 2014 by archsydney.